Mazda are further increasing their fleet focus with growth of their Fleet Specialist Dealer Network and expansion of their corporate sales team. 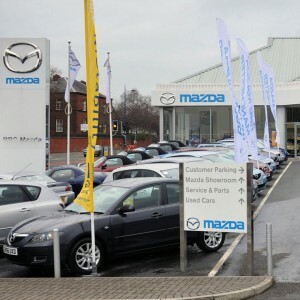 Holdcroft Mazda, Stoke-on-Trent, and RRG Mazda, Salford, have become the fifth and sixth franchise dealers to join Mazda’s network. Meanwhile, a restructuring and expansion of the Mazda corporate sales team aims to further support fleet customer relationships and strengthen partnerships with contract hire and leasing companies. Steve Tomlinson, Head of Fleet at Mazda, said: “Involving a fifth and sixth dealer in our Fleet Specialist Dealer Network gives Mazda an even better geographical spread in terms of customer proximity. “That in turn means that vehicles can be delivered more swiftly to customers and, importantly, reduces the carbon footprint relating to deliveries. “Additionally, it means a further increase in Mazda’s fleet capability. Previously, four Mazda dealerships – Arnold Clark in Stirling, JCT600 in Bradford, Norton Way in Letchworth and Johnsons in Oxford – handled approximately 65% of Mazda’s contract hire and fleet business. Mazda say that by adding a further two dealerships, they are better equipped to provide the excellent levels of service demanded by todays fleets. Furthermore, the establishment of a ‘sold order pot’ means Fleet Specialist Dealers are able to meet corporate demand typically within 10-14 days of orders being placed. The Japanese manufacturer are keen to embrace other dealers who have the desire and infrastructure to join their fleet group, they said. “We are receiving and ever-increasing the number of inquiries from businesses that want to add Mazda to their company car choice lists,” added Mr Tomlinson. Meanwhile, Chris Stableford has been promoted to the newly-created post of National Fleet Sales Manager and now heads up Mazda’s fleet sales team. Mr Stableford was previously National Contract Hire Manager. In a further move, Jonathan Reynolds has moved from a retail role in Mazda to fulfil the new role of National Contract Hire Development Manager. He is responsible for leasing company relations and fleet specialist dealers. Mazda have also expanded their regional corporate sales manager team with two new appointments. This is in an attempt to ensure maximum coverage and support is available for existing end-user fleet customers and to develop new business opportunities.